These coats are ideal for keeping your dog cool and comfortable in hot weather. The fabric has a unique cell structure, which slowly releases moisture, without wetting the coat, and can keep your dog cool for hours. Dogs struggle in the heat, as they are unable to cool down quickly through sweating and are vulnerable to overheating. As vets, we recommend Easidri coats, as they can keep dogs of all shapes and sizes cool and help to prevent overheating and heat stroke. 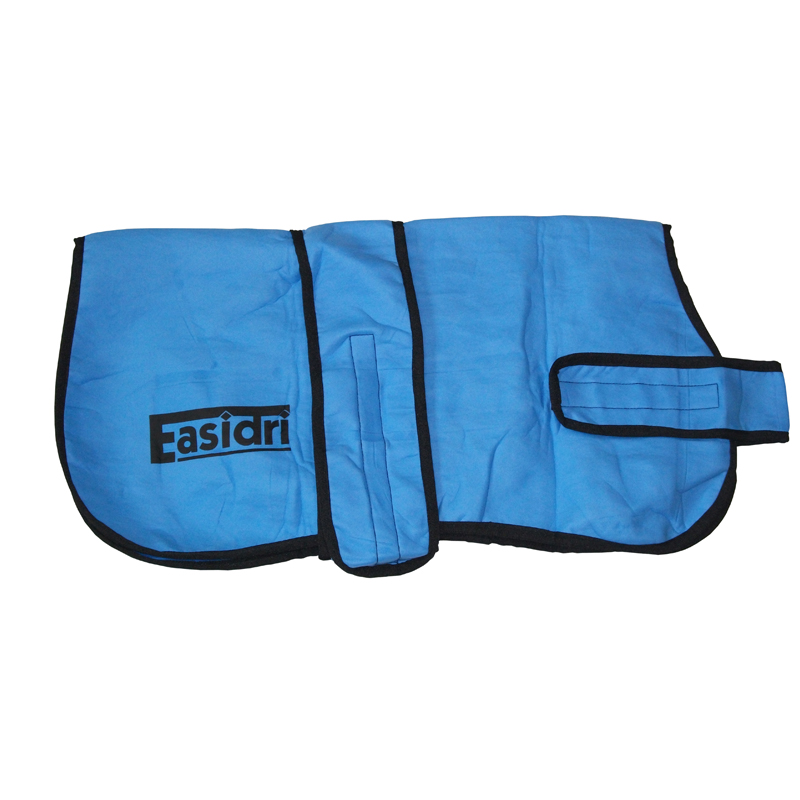 Easidri Cooling Coats are super absorbent and machine washable. They are also durable and resistant to tearing and shredding. They come in a handy storage case and are easy to fit. Simply immerse the coat in cold water, wring it out and fit it on your dog. The water stays in the fabric and evaporates slowly as the hot air rises from your dog, leaving your dog cool and dry. Use the size guidelines below to help you choose the correct size. We recommend you try the coat on before you soak it. Soak coat in cold water before use and wring out, leaving the coat slightly damp. If the coat becomes soiled, it can be washed using household detergent or the Easidri Coat & Towel Wash. It must be washed at under 30 - 40° C. Do not wash with fabric softener. Do not tumble dry or allow the coat to dry out. Store it slightly damp. If the coat dries out, during prolonged use, do not try to open the coat out but rehydrate by soaking thoroughly in cold water then wring out. After each use, rinse the coat with a small amount of coat and towel wash to keep your product fresh. The Easidri Grooming Towel is a super absorbent towel that acts like a sponge and soaks up moisture fast. It is perfect for drying wet horses and pets in minutes and can dramatically reduce your grooming time by up to 60%. It holds water without seeping and only releases that water when you wring it out. The Easidri Coat & Towel Wash contains DuoMax, a DEFRA tested technology, which kills 99.9999% of bacteria, fungi and viruses but is safe to animals, humans and the environment. This gentle but effective formula is suitable for all fabrics and materials, including rugs and clothing. It also removes odours and maintains a fabric's waterproof properties. We recommend using this product to clean and disinfect the Easidri grooming towel and cooling coat.